Compact circular stranded copper conductor complying with BS EN 60228 Class 2. Extruded semi-conducting compound bonded to the insulation and applied in the same operation as the insulation. Extruded cross-linked polyethylene (XLPE) suitable for operation at a conductor temperature of 90°C. Extruded semi-conducting compound applied in the same operation as the insulation. Cold strippable screens are supplied as standard but fully bonded screens may be provided if specified. Copper tape screens applied overlapped to provide an earth fault current path. Extruded black polyvinyl chloride (PVC) or Low Smoke Zero Halogen (LSOH) compound is supplied as standard. Alternative materials may be provided if specified. Single layer of circular aluminium wires. Extruded black polyvinyl chloride (PVC) or Low Smoke Zero Halogen (LSOH) compound is supplied as standard. Alternative materials may be provided if specified e.g. medium density polyethylene (MDPE). ♦ See Cable Jointing Tools for 6.6kV cables. 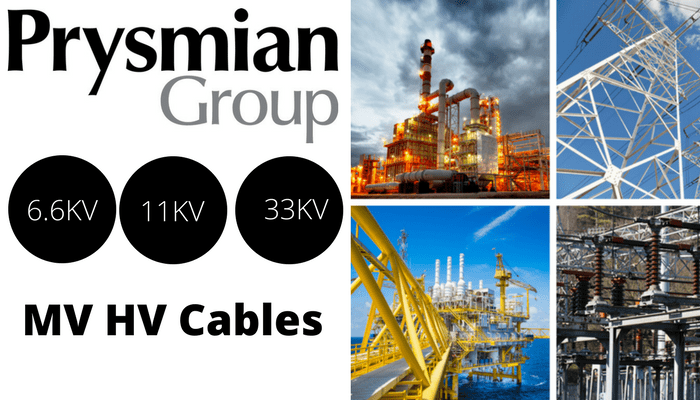 ➡ View the complete Prysmian range of MV-HV Cables (6.6kV 11kV 33kV). 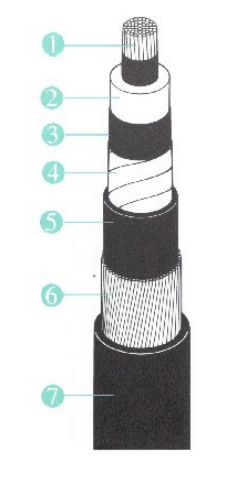 6.6kV single core cables are available in the following cable conductor cross section areas: 70sqmm, 95sqmm, 120sqmm, 150sqmm, 185sqmm, 240sqmm, 300sqmm, 400sqmm, 500sqmm, 630sqmm. 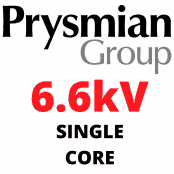 ➡ For medium voltage electrical data about 6.6kV single core cables including bending radius, cable diameters, cable drum lengths, weight, insulation type and cable sheath thicknesses please refer to the download opposite. Should you require 6.6kV cable accessories please visit MV-HV Joints, Terminations & Connectors – we distribute Pfisterer, Nexans Euromold, Elastimold, SPS and 3M cold shrink and heat shrink cable accessories for jointing, terminating and connecting MV-HV cables into switchgears (GIS AIS), transformers and high voltage substations.